On a trip to Springridge Farm this past weekend, I picked up some lovely, sweet red strawberries. I had seen some in the grocery store and didn't buy them knowing I could eat local and support a family business at the same time. Springridge is a great place to visit - there is tons to do with kids and a quaint country store to do some shopping. 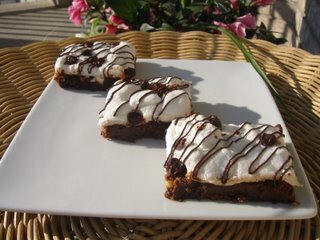 They also serve yummy baked goods too - strawberry tarts and pies! Unfortunately, strawberry season is quickly coming to an end this year but we do have raspberries to look forward to. If you happen to have some berries around, an easy treat is to make scones. 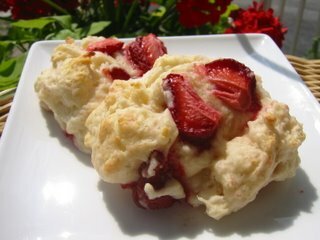 Just use your favourite recipe and fold in fresh chopped strawberries. Simple and tasty. To dress them up, add a drizzle of white chocolate and you have a nice summertime treat. c) resemble a fabric made fashionable by Coco Chanel. If you guessed "C", you're correct! These cookies are meant to have a tweedy look due to the chocolate speckled throughout. They're easy enough to make but plan ahead - they require a few hours of chilling time. A bonus is that you can have refrigerated logs of dough in your refrigerator up to 3 days before you bake. 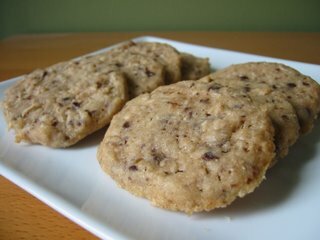 The cookies also have coconut in them, giving them a nice chewy texture that contrasts nicely with the crispiness of the cookie. One thing about the recipe that should not daunt you is the measurement for slicing the logs. The recipe calls for 3/16-inch slices. My ruler was not that exact in its measurement so I interpreted it as 'thin', but not too thin. Overall, the cookies are pleasing and a change from chewy cookies. They're small and neat, perfect for a cookie tray and afternoon tea. No recipes, just a meme for today. Thanks to Linda at Make Life Sweeter for the tag. 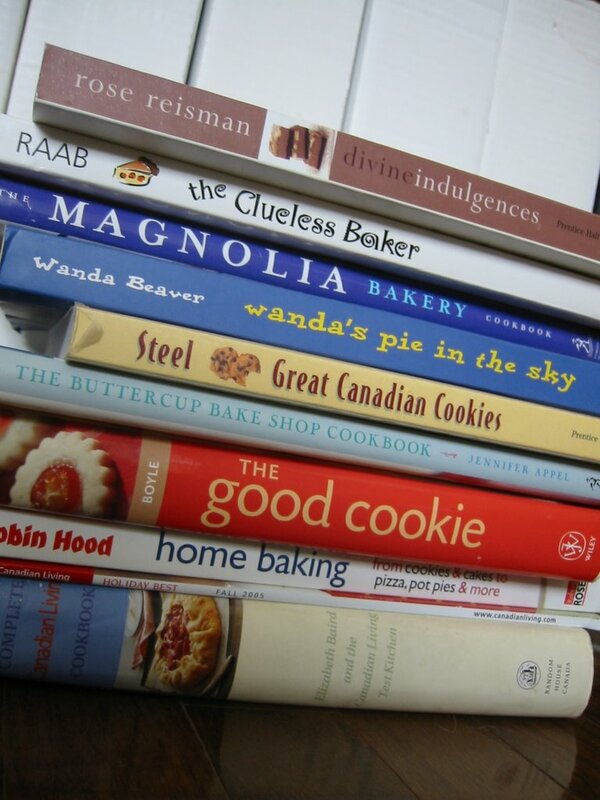 I usually get recipes from the cookbooks I have and Canadian Living magazines. They are a staple in my house – I’ve had a subscription since 1999. I try to do at least one new recipe a week to post on my blog. If the recipe comes from a book or magazine, that’s where they’ll stay. I don’t have a huge collection of books so I remember where a recipe comes from. Sometime I have to bookmark magazine recipes because they’re harder to find when you have so many. I keep the magazines sorted by year in Ikea magazine holders. If I print a recipe from the Internet, they go in their own file as well as hand-written ones. This doesn’t always work because I’m always finding folded recipes in the pages of my books. It used to be very large but I weeded through it and threw a lot of random stuff out. Now I have two full binders of recipes arranged by author and/or book title, a lot of magazine holders and my books take up two shelves on my bookshelf. What is the oldest recipe in your “to try" pile? I honestly couldn’t tell you…all the really old recipes got thrown out because I knew I’d never make them. I would like to think so but, I’ll never get around to making all the things I want to. I follow a recipe to the letter the first time I make it and every time after that. I really like the structure of a good recipe – how it will always turn out well every time as long as you follow the instructions. With baking, you don’t have a lot of leeway to experiment with basic ingredients but I will sometimes do substitutions for add-ins. I’m not afraid to try anything once. Tag at least one new food blogger for this meme (“new" as in only blogging a few months). She isn’t a fan of memes but her site is fun to read, very honest and amusing. I think everyone I visit has already participated in this meme! Have a great weekend! Here's another recipe that's great for using up apples that are getting soft. 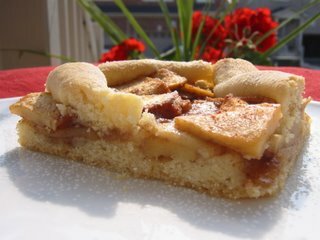 Apple Squares are exactly what the name implies - an apple filling mixed with brown sugar and cinnamon that is spread over a buttery batter. The batter is soft and easy to work - using your hands to pat down the dough works well. The recipe also calls for the extra dough to be arranged on top like a lattice. This makes the squares look pretty but one change I would make is to roll the lattice strips thinner and use more that just 5 x 5 because they do puff up when they bake. Overall, the square is tasty, versatile and simple. I think pears would work as well and if you like dried cranberries, they would go nicely with the apples. I would make it again and serve a big scoop of vanilla ice cream on top. Perfect! I've had a package of marshmallows in my cupboard for a while waiting to be made into brownies. An occasion popped up yesterday where I was be able to make them and have the opportunity to share as much as I could with friends and not have too much left at my house. Need to use up those ripe bananas? 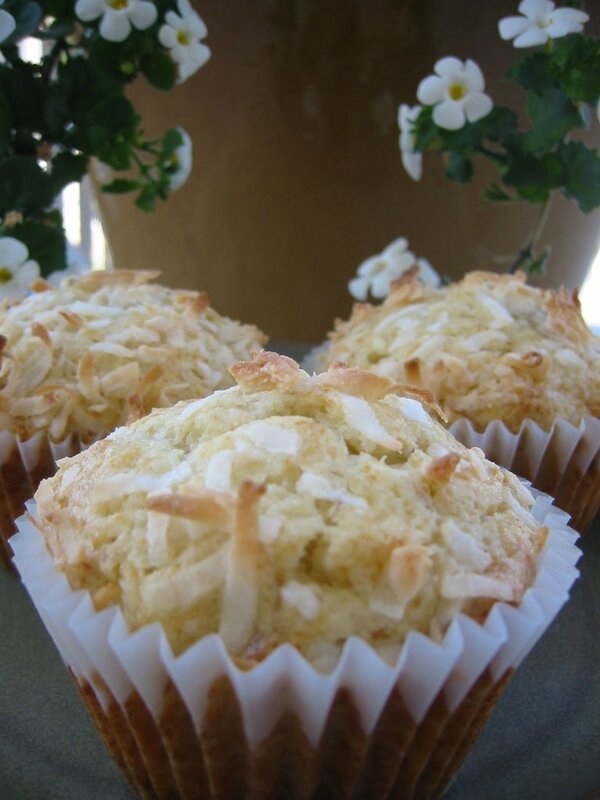 Banana Coconut Muffins are simple to make with ingredients found in most kitchens. The recipe only makes eight muffins and they bake up golden with nicely browned coconut on top. There is no liquid add-in for this recipe - the moisture comes from the mashed banana, butter and an egg. The muffins are moist and flavourful and don't require a lot of time or effort to prepare. If you wanted to make mini-muffins you absolutely could - just reduce the baking time. The recipe comes from epicurious.com and if you don't like coconut, I believe chocolate chips or dried cranberries would work equally as well. Give 'em a try! What is rhubarb? This distinctly colourful plant is seen all over Ontario in the summer yet many have never cooked or baked with it, including myself. What do you do with those red stalks? 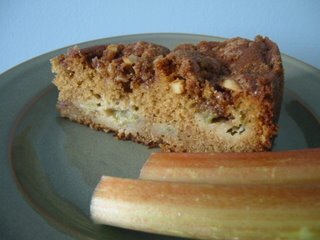 Well, you can use them to make ice cream as the Candied Quince did or you can make it into a tasty Rhubarb Coffee Cake. The cake I made called for fresh chopped rhubarb and was a snap to prepare. The recipe introduction stated that the cake was "studded with juicy pink rhubarb" which I thought would look pretty but when I chopped up the rhubarb it was more of a light lime green - only the outside was pink. I got a bit nervous cutting it up because it looked like celery and I didn't want to make celery cake. My fears were intensified when I actually took a bite and it was sour, ack! Mr. CB came over and picked up a couple chunks and said "Yum rhubarb!" I asked him if this was how rhubarb was supposed to taste and he said yes so I proceeded to make the cake completely unsure of how it would come out. Well , it turned out just fine and the rhubarb got soft except I had juicy green chunks instead of pink. Mr. CB loved the cake and when I tried it, it was not sour at all! Wow, I was surprised. It was moist and yummy - definitely a recipe to try again. Maybe the rhubarb I bought wasn't ready to be eaten yet. Should the stalks be pink all the way through? Any insights would be appreciated because I would love to continue my Summer Adventures in Rhubarb! I know that plums aren't in season just yet in Ontario but, I couldn't resist picking some up at the grocery store this weekend. (Months of buying apples, pears and bananas will do that to you.) The recipe I had in mind was one I had wanted to try for a while - Plum Sour Cream Kuchen. 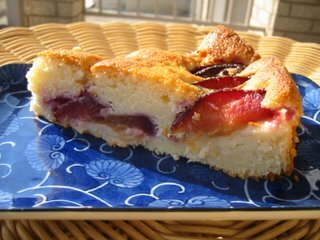 Epicurious.com defines kuchen as "A fruit- or cheese-filled yeast-raised cake, usually served for breakfast but also enjoyed as a dessert. 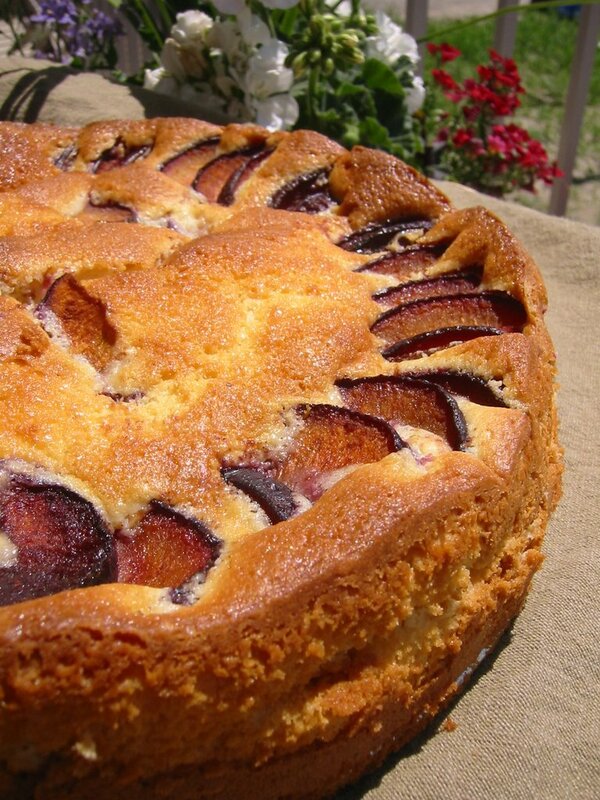 It originated in Germany but is now enjoyed in many variations throughout much of Europe and the United States. The word kaffeekuchen is German for "coffee cake." 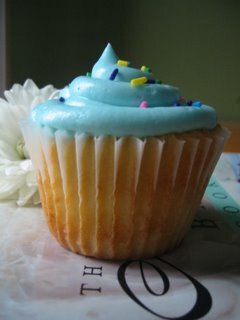 I've had the Magnolia Bakery Cookbook for a long while now and decided it was about time I made their famous cupcakes. I was going to take them to the bakesale but ended up taking them to a birthday party on Saturday instead where they were very much appreciated. The cupcakes were easy to mix together and only contain the very basic of ingredients - butter, flour, sugar and milk. It does call for self-rising flour (which I don't have) so I added some baking powder. The first batch I made came out fine and golden , though some were bigger than others. The second batch came out more evenly sized. Once they were cooled, I iced half blue and half pink. (I was going for red but ran out of the red food colour paste.) The Magnolia buttercream is also very basic - icing sugar, butter and milk. It was sweet and creamy and tasted exactly how you'd imagine it to taste - like icing. The more you beat it, the creamier it got, almost to the point of melting in your mouth. The cupcakes won rave reviews in my house. My taste testers said the cake was great and seven were eaten before we got to the party. I think cupcakes are fun to make and look really nice all dressed up with icing and sprinkles. They're portable, not too messy and kids and adults like them. I have some leftover pink icing so I think I'll make some more. I'm sure they won't last long! I never watched Seinfeld but somehow I knew there was a connection between the show and possibly New York's most famous cookie. After a little searching my thoughts were confirmed and I found the above quote and realized that the Black & White is as important to New York as the butter tart is to Canada. Black & White cookies are sold all over the city and there are big discussions on where to find the perfect one. I don't think and self-respecting deli would be caught not selling them. Maybe I'm exaggerating, but they are definitely a New York staple. The recipe I made comes from The Good Cookie. I've been eying this recipe for a while because it sounded amazing. 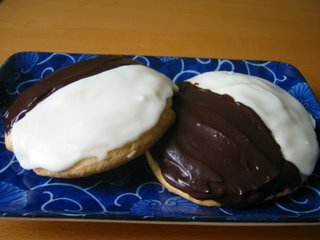 A big vanilla cookie topped with two glazes sounded super yummy and, as I have no plans of visiting The Big Apple anytime soon, I made them. Well, the cookie baked up perfectly. They are big, cakey and can be described as more of a flat cake than a cookie. The glazes were easy to make and icing them was not hard although I'll have to work on making them look smoother. Unfortunately, I can't tell you how they taste because I sent them off to the local public school for a bakesale tomorrow. No matter though. Now I have a reason to make them again. If Seinfeld was right and the cookies could increase racial harmony, I'd make them every day.